YoyBuy – is one of the world's most famous mediators of Taobao store. The company was established in 2007. Since that time, it has been actively developing and now the company has more than 100 employees. Now YoyBuy serves customers around the world, on all continents. Most products are delivered to CIS countries, USA and Canada. YoyBuy is a leader in the world in the list of Taobao intermediaries. If you choose YoyBuy as a mediator, you get a lot of advantages, namely low rates and favorable exchange rates, automated process of goods ordering, a bonus program and the lack of restrictions on the minimum amount of order or the number of products in one order. We should tell about Taobao store. It is one of the first and the most famous Chinese stores, which can also be called an auction. "Taobao" in Chinese means - "treasure". The store was established in 2003 by Alibaba Group, which also owns not less famous AliExpress shop. The shop is focused exclusively on the Chinese market, that is why the website language is Chinese and all transactions of purchase/sale is carried out only in RMB. Due to the fact that the store is only for the domestic market, the prices there are much cheaper as compared to shops that sell goods directly abroad. Now there are many intermediaries, which facilitate the process of buying and make it accessible to many. Taobao is like eBay and AliExpress and works under the "user to user" scheme. The shop website is among the top 20 most visited websites in the world. The principle of operation of YoyBuy is that buyers put in an order for order of respective goods from Taobao and make payment for the goods. Then the YoyBuy employee clarifies the details and availability of goods from the seller and orders it or returns the money back to the buyer if the product is not available or in case of force majeure. 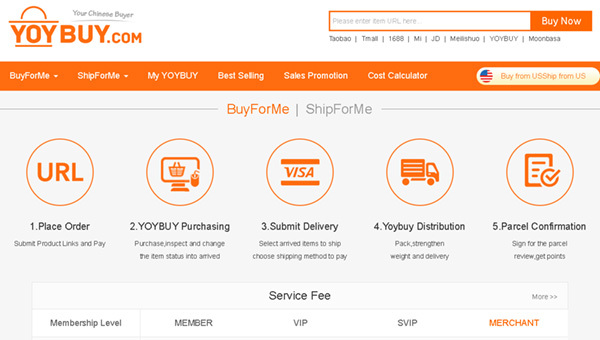 Once the goods are delivered to the YoyBuy warehouse in China, the buyer pays the shipping cost to his/her country and the cost of YoyBuy services. Payment in YoyBuy is made by using payment cards Visa or MasterCard with a transfer fee of 3.5%. You can also pre-fill your account at YoyBuy using WebMoney (the commission is 2%), Qiwi (4%), payment cards Visa or MasterCard (3.5%) and money transfer Western Union. Then you can use the money from your virtual account on YoyBuy. The status of your order can be viewed in the "My Orders" section. There is a button opposite each order, which allows you to contact the YoyBuy employee if you have additional questions. If the goods could not be ordered for some reason, the respective employee writes you about that and the money will be returned to your account. If the purchase status is "Ready for delivery", it means that goods are already in stock of YoyBuy, were checked for the absence of damage, packed and are waiting for shipment to your address. Orders will be kept for 90 days in the warehouse for free. Then you will need to select all the products you ordered and are already in the warehouse of the agent and confirm the delivery. In this case, you will get a bill, which consists of the shipping price (on your choice), insurance fee and a percentage of purchase for the intermediary services. After you pay this bill, your item will be sent to the mail office and a track number will be assigned to it. Thus YoyBuy - is one of the most convenient and easiest way to order goods from Taobao. However, you should consider whether you need to order it from Taobao, since unlike other Chinese stores, the purchase will take longer and in most cases will be more expensive. However, the choice of goods on Taobao is much wider then in competitors.